A triabolo is a figure made of three equal isosceles right triangles joined at equal edges. There are 4 such figures, not distinguishing reflections and rotations. A tetrabolo is a figure made of four equal isosceles right triangles joined at equal edges. 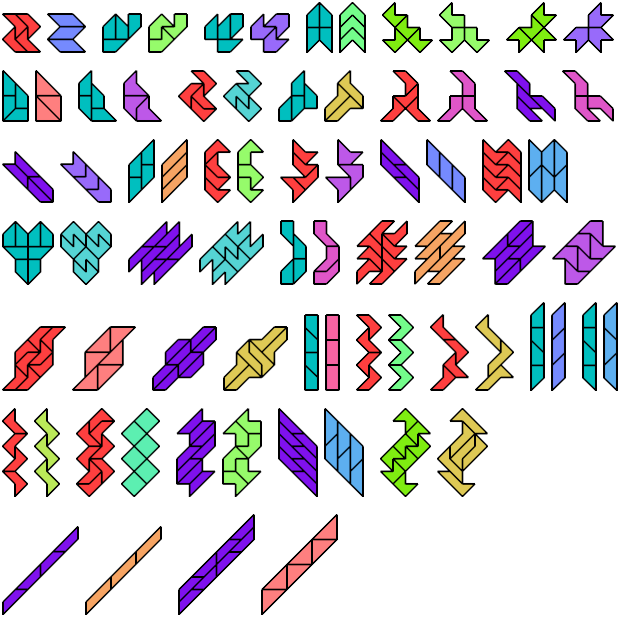 There are 14 such figures, not distinguishing reflections and rotations. Here are minimal compatibility figures for triaboloes and tetraboloes. Not all are uniquely minimal. All solutions are minimal. Few are uniquely minimal.